Las Vegas, NV – May 5, 2016 – All race distances are now open for the 2016 Rock ‘n’ Roll Las Vegas Marathon & ½ Marathon. One of the world’s most unique running events, race weekend returns November 12-13 celebrating the 50-year anniversary of the first ever Las Vegas Marathon. The 10K is run simultaneously with the marathon and half marathon on Sunday, November 13 and allows runners the opportunity to run down the closed Las Vegas Strip at night at a shorter distance. 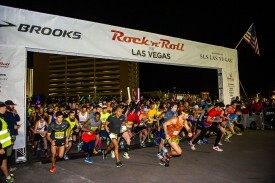 The 5K presented by Brooks takes place on Saturday, November 12 at the festival grounds across from the SLS Las Vegas with a free post-race concert for participants and spectators. Runners who choose to participate in the “Remix Challenge” can earn a bonus third medal by running in both the 5K on Saturday and any distance on Sunday. Rock ‘n’ Roll Las Vegas returns November 12-13 as the only private event to exclusively shut down the Las Vegas Strip at night. Race highlights include all of the must-see Vegas sights such as the iconic ‘Welcome to Las Vegas’ sign, the Fountains of Bellagio, and finishing at the foot of the Mirage volcano. Race day begins with a start line festival at the Las Vegas Village and a pre-race concert for the runners and their friends and family. The 2016 headliner has not yet been announced, but past headliners include Kid Rock and Macklemore & Ryan Lewis. In addition to the headliner concert, live bands and DJs of every genre will play along the race courses entertaining and encouraging runners as they make their way to the finish line.